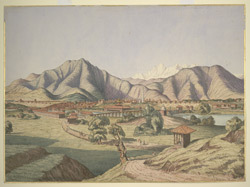 Dr Oldfield, who was Residency Surgeon at Kathmandu from 1850-1863, wrote in 'Sketches from Nipal, Historical and Descriptive...' (1880), "Kathmandu, from being the capital of the kingdom, is the most important city of Nipal. It is situated towards the western side of the valley, about a mile from the base of Mount Nagarjun, and stands on the east or left bank of the Bishnmatti, near the confluence of that river with the Baghmatti...On the west Kathmandu is bounded by the Bishnmatti, and its streets, or those of its suburbs, slope down rather steeply from the higher level on which the greater portion of the city is built, to the very edge of the river, which flows in some places directly below its walls. The Bishnmatti is crossed by two pucka bridges, over one of which goes the road from the city to the arsenal, and artillery barracks and parade-ground, and over the other the direct road to the temple of Shambunath. On the east and south the city overlooks the lowlands which lie along the courses of the Dhobikola and Baghmatti rivers."